This has been on my mind for two reasons. One is that I got the call that my trailer is ready, which excites me to no end. The other reason is that after I wrote my post on designing sparefully, which included a lot about the importance of being still, I noticed that WordPress lists my user name as the author: notsostill. That made me laugh. It also made me reflect on the role of stillness in my life – or rather, the lack thereof – and why a tiny house on wheels is so perfect for me. Fresh out of film school, I thought I would set myself up as a freelance film and video editor and toyed with a business name. 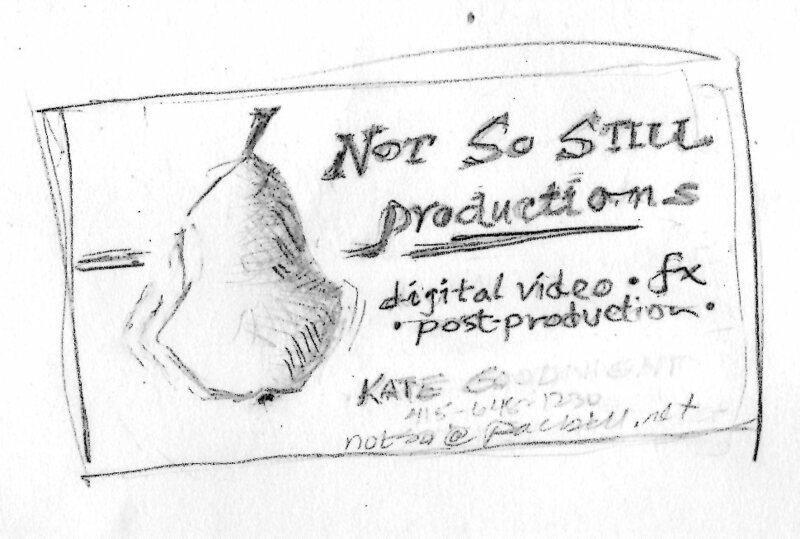 I made some sketches for business cards contrasting video with still photography. For various reasons, that’s pretty much as far as it went, but the user name stuck in my head and it’s turned out to be a fairly good summation of my life. Between my father’s medical training and his stint as an army doctor during Viet Nam, I lived in thirteen homes by the time I left for college, and the pace just increased after that. My personal best was moving five times in one year during a particularly bad rental market in the Bay Area when I couldn’t find a permanent place to live. I felt like a ping pong ball bouncing around in a fish tank. Fortunately, everything I owned still fit in the back of my pickup (it was later that things started to accumulate). Poor Naj moved more than any cat should, though it didn’t seem to faze him overly much. I’ve lived both alone and with partners and roommates. Mostly I’ve lived in apartments and shared houses, but there was also a tent once when I worked at Sycan Marsh and a mobile home when I worked for the Forest Service. I’ve lived in places where I listened to gunfire at night and had to deal with break-ins and robberies, and places where I didn’t bother to lock the door. At one point I actually bought a small bungalow in Portland, Oregon. That lasted all of a year and a half before I felt the inexorable pull back to California. That was when I realized that my lifelong dream of owning a house came with a giant anchor weighing me down. While this constant upheaval has made for a fairly chaotic life, it also brought the excitement of new beginnings and granted the richness of varied experiences. I’ve lived up and down the west coast and a bit in the midwest and east, and in high school I spent a summer in Sri Lanka on an exchange program. I traveled for five weeks through Europe with nothing more than a daypack. As much as I envy people who have the constancy of a home lived in for years, I’ve come to realize that wanderlust is an important part of my nature. It is starting to evolve, however. Throughout all of this, there was one house that was always there – that of my grandparents. The house itself wasn’t too remarkable, it was built from a set of plans bought from a Sears Roebuck catalog in the early 60s, but it had the most awesome view looking out at Mt. Adams and the Columbia River Gorge. No matter where my family was living at the time, or myself when I was on my own, I could always come back to look at that view and feel connected to my family and my childhood. The view was different every time due to the weather, the time of day, the seasons. Once the aurora borealis even danced around the mountain. While my grandparents have been gone for a number of years, we kept the house in the family. Last year the decision was made to sell it. There were a lot of emotions to work through, but it felt like the right thing to do. I’ve learned over the years that you don’t need to necessarily own property to feel a part of a place. Once you’ve lived somewhere, it is always a part of you. This has made me think about how we each possess our own internal cartography, our own unique inner map of our world. It’s made up of all the places where we’ve been, filtered through our experiences. We only know what we know, so our maps don’t necessarily cater to “reality”. I just read an interesting blog article in which Kevin Ryan compares two maps he saw in the British Museum. Both were of the American Midwest in the late 1700s. One was on deerskin by a Native American: “The map only shows the Native American settlements and the rivers, not the physical features of the land over which these people hunted and roamed. It illustrates communities, not landmarks; habits of use, not geography. Above all, it does not show patterns of ownership. Like everybody, Native Americans mapped what mattered to them.” Notably, it doesn’t show the densely populated city of St. Louis or any other European town. Conversely, a map of the same area done at the same time by the British-controlled Wabash Land Company shows every town, road, building and parcel boundary, but not a single Native American community. We each have a map within of what is important to us. As newborn babies, we have a very blank map with just one big fuzzy image of mom. Over time the details start to fill in. The lines start to connect, the relationships to make sense. It is a map of our memories and our spatial conceptions. Besides the places we’ve lived, it has radiant areas where we’ve been the most happy and dark clouds over places we’d rather forget. It has little drawings for rare animal sightings and exotic trips and passionate trysts. Piri Reis World Map, 1513. Our maps have little beacons where our family and friends live, lighting up our dusky chambers. My friend Nancy recently sold her house in Marin where she has lived since I met her. Though she’s moving closer to me, I realized I haven’t re-calibrated my map. When I think of her, it’s still in Marin and then, disconcertingly, like an amputee feeling their phantom limb, I realize my map is out of date. I’m sure it will adjust after a barbecue or two (hint, hint). Like the Talking Heads song, I think nearly everyone has a home where they want to be. They may not have lived there for years, but it’s at the end of the string trailing out behind them. It may be where they were born. It may be where there is some mystical, spiritual connection, or where a loved one is. Maybe its somewhere they haven’t even been, the stuff of dreams. It’s the place we feel inexplicably drawn to. I have two such places, which complicates things. Both are utterly, completely sacred to me. 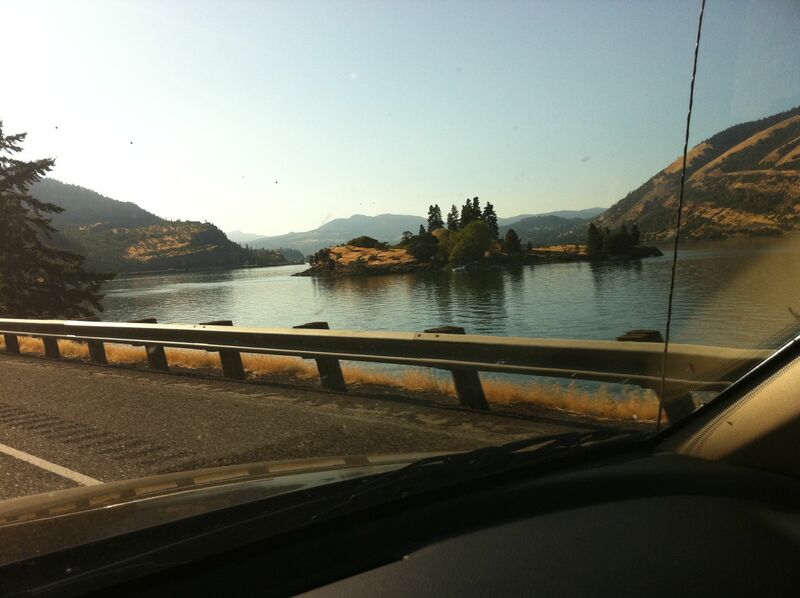 One is the Columbia River Gorge separating Oregon from Washington, where my grandparents lived and my mom and uncle grew up and have each now returned to. 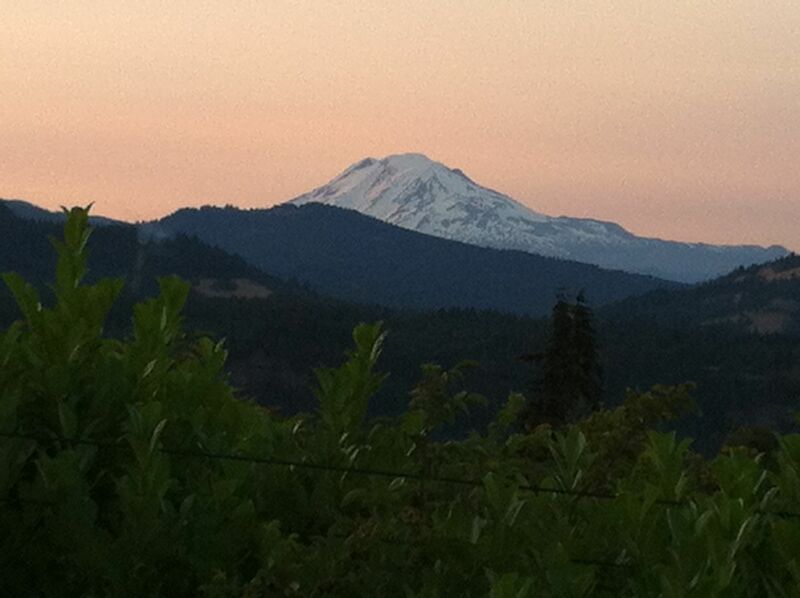 It doesn’t matter how many times I make that drive, the majestic beauty of the place takes my breath away. As much as I have roots, that’s where they dig deep. The other is the Point Reyes National Seashore just north of San Francisco. With its remote beaches and estuaries, rolling hills and wooded ridges, there is something there that radiates peace. Whether it’s for a long hike or a picnic on the beach, I go there every chance I get. Many a bottle of wine has been shared in the dunes. I’ve gone there to celebrate life’s significant moments and to grieve over losses of loved ones. Every time the place speaks to me. 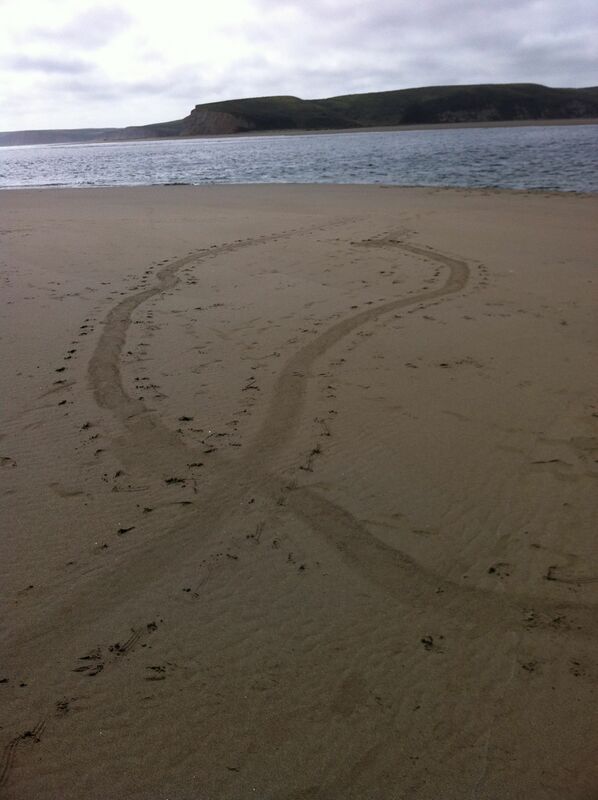 Tracks of mating sea turtles, Point Reyes National Seashore. This was the end of a very mystical day with my sister. Watched by a coyote, we followed a raven who led us to the remote place where we discovered the turtle tracks. Strange but true. I consider myself an Oregonian, but have now lived more years in California. Both are an integral part of me. At this point, my skin is furred with northwest cedars and my intestines are lined with coastal sage. The Columbia River flows through my veins and California poppies ring my hair. Like the sea turtle, I’m pulled by the moon and earth’s magnetic fields when I stray too far from one or the other. You can see my dilemma. And being the sharp readers that you are, you can see why I might like the idea of a tiny house on wheels. The beauty of a tiny house on wheels is that you can always take it with you. Given my boomerang lifestyle and weariness of renting, this is a major plus. When I retire from state service in a few years and enter a new phase of my life, my initial idea was to spend part of the year in Oregon and part in California, toting my tiny house between the two. This has waned somewhat as I’ve learned that though they are mobile, tiny houses aren’t as easy and cheap to cart around as an RV. It probably makes more sense to leave it in one place and find another way to spend extended periods in the other location. But it’s nice to know I’ll have the option to follow my heart where it leads. 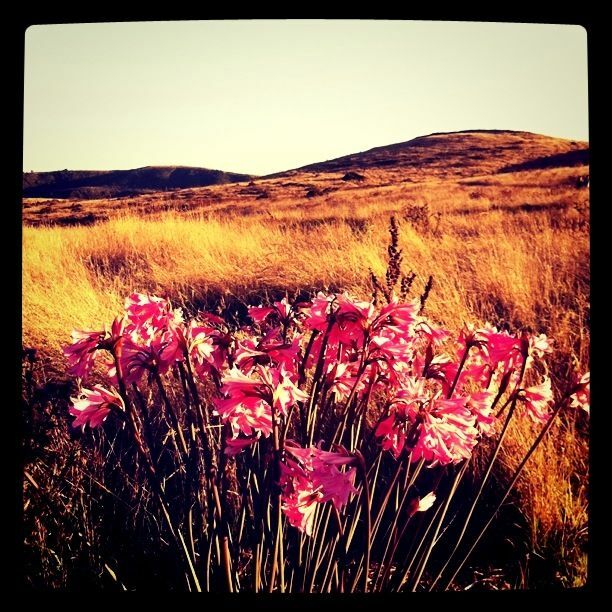 Naked Ladies at Point Reyes. That said, I do find my wanderlust is dampening down a bit. I feel more and more of an urge to settle, to grow a vegetable garden, to be more still. 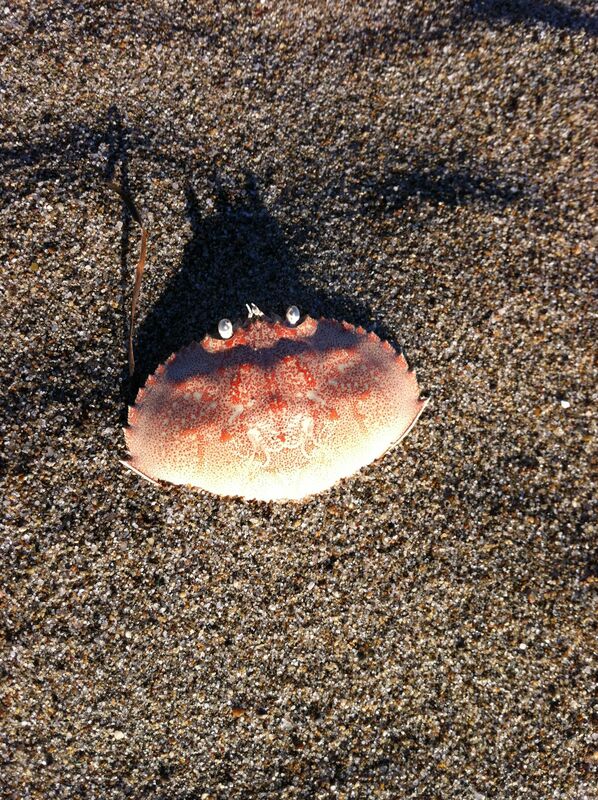 Crab at Point Reyes on the day of the solar eclipse. The tiny house represents both groundedness and incredible freedom at the same time; a place for meditation and for creative abandon; a way to connect with my roots while creating fresh memories; the potential for adding new beacons and communities to my inner map while keeping in touch with my old ones. This is how a tiny house can blend the best parts of being still and not so still. 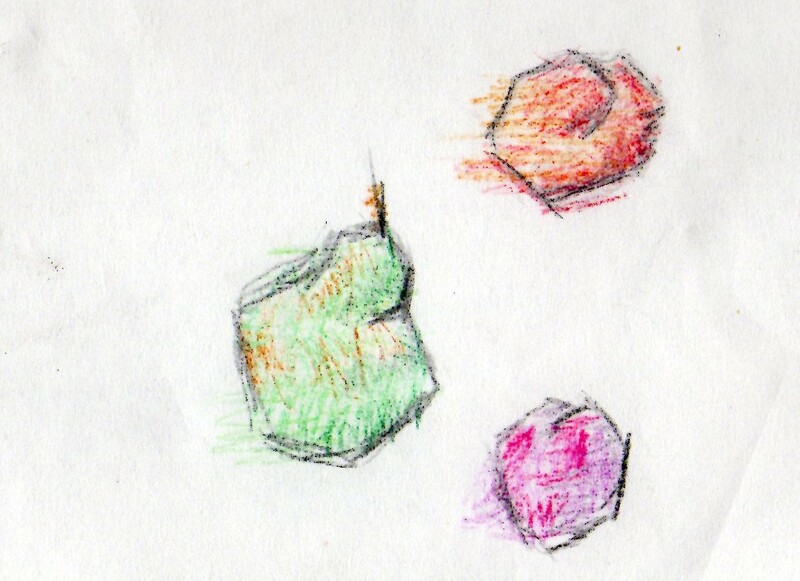 Sketches for a still and not so still life. Dear Kate…..I woke up early to practice my presentation for our second day of our second design workshop and I am so glad I paused to read this post. Thank you, thank you, thank you for your words, wisdom, and the courage to share. Keep writing. It speaks to me and I am to sure many others who are lucky enough to be following your journey. Thanks so much, Joan; that means a lot to me. Good luck with the presentation – I wouldn’t be doing this if it wasn’t for PAD and all of your help! Wow! I am getting to know you more through this blog than ever before. I feel your words as they wash over me like a cool brook. I’m so happy for you Kate. You are following your dreams and mapping out new terrain. Yes, my heart will always be in Marin where I have spent most of my life, it’s in my blood. Yes, it’s time for some BBQ in my new east bay home (I can see Marin County from my deck). Can’t wait to see you and follow you on your journey. Nancy! It’s an adventure, for sure – all sorts of challenges and new experiences. It feels good and meaningful in ways I hadn’t expected. Can’t wait to see you and hear all about your own adventures in Thailand!